Entrance into the track is from YONKERS AVE.
For 2009, we've partnered up with Yonkers Raceway and Casino to bring something a little, dare we say, different. 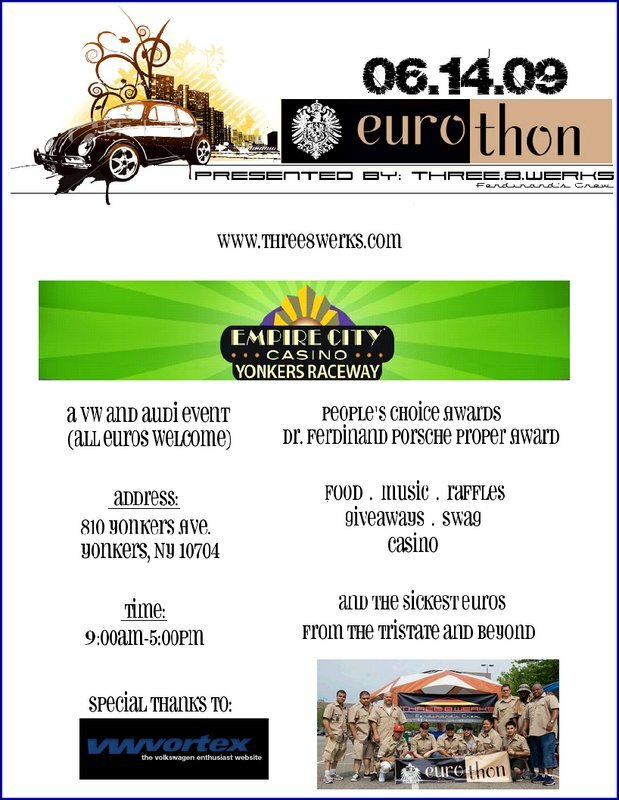 Where else can you look at some of the sickest euros from around the Tristate area, but also try your luck at the jackpot? Well, at eurothon 2009 it's very well possible for you win the big bucks! As far as the show, we're going to have a select exclusive vendor section, VIP display area, in-Track parking for show cars, amazing photo-ops, free T-shirts and Dash-Plaques provided by Yonkers Raceway and much, much more. PLEASE TAKE NOTICE: The Raceway Police as well as the city's police will be there. No speeding or burnouts, and no cars/people are allowed on any of the grass areas. Understand that if you act up, you will be asked to leave. Please be respectful. We work hard for this event to happen. Thank you. Also, VWVortex, as the top level sponsor, has provided us with a discussion forum. Thank you to the administration for your participation. We're looking forward to 06.14.09, we hope you are too. It is 2 hours 45 mins away from RI and looks to be a pretty decent show considering they have had this thing running for 8 years now. Who's down?